Gallery Nosco is pleased to present Talking with Fabrics, a solo exhibition by the Peruvian artist ALBERTO CASARI (b. 1955). Synthesizing ideas Casari has been developing during his artistic quest, the exhibition features textile-based artworks as well as sculptural work. Talking with Fabrics explores Casari’s subjective excursus from highly conceptual works to minimalist, almost nihilist artworks able to depict the inner essence of art and the multitude of cultural and artistic references the artist draws upon. Within the exhibition, fabric plays the crucial role of establishing, even if metaphorically, a strong connection with the cultural blending that the artist has experienced in first person. Initially referencing to his Latin-American origins and inspired by the Pre-Colombian craftsmanship of textile and ceramic, the artist is able to create a body of work that pays homage to its ancestors while being a connecting bridge with other times and cultures. 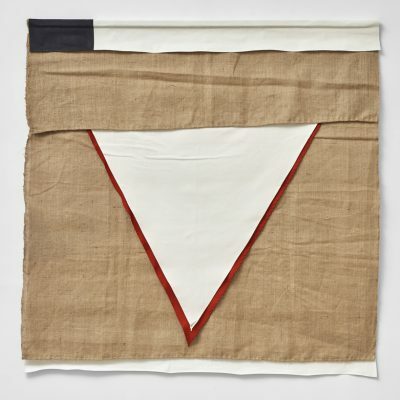 Moreover, the seventeen years spent in Italy led the artist to assimilate the trends and motives behind the movement of Arte Povera with its minimal conceptualism and humble materials. Stripping materials away from their original meaning and context is the tool through which the artist also engages with the apparent death of painting. The heteronomy of Casari’s work reflects the diversity of his life experiences and the way he has approached being an artist in today’s society. In fact, since the inception of his artistic production, Casari has exploited several aliases that stood for different artistic approaches within his own subjectivity. Through a process of impersonal creation, the artist and his alter egos (A. Covarrubias, A. Kobayashi, El Mistico) founded the PPPP, Productos Peruanos Para Pensar (Peruvian Products to Think), a company hiding the individuality of the artist and its fetishist obsession for the signature. Such fragmented identity has been able to utilize the likewise fragmented identity of painting in order to create a new heteronomous and dynamic notion of the medium. A dead painting becomes a new version of itself, a polyhedral surface embodying a feeling of full potential. Losing the solidarity of an individual identity has offered the artist the opportunity to investigate matters from a somewhat omniscient point of view. Nevertheless, it is from the beginning of this year and celebrated by this particular solo exhibition that the artist has decided to leave behind all of his alter egos in return for a newly accomplished unity within his own persona. Talking with Fabrics is to be experienced as a journey inside and outside the artist’s personal view on art that is ultimately focusing on the intrinsic features of human and material identities while ignoring any sort of judgemental hierarchy.